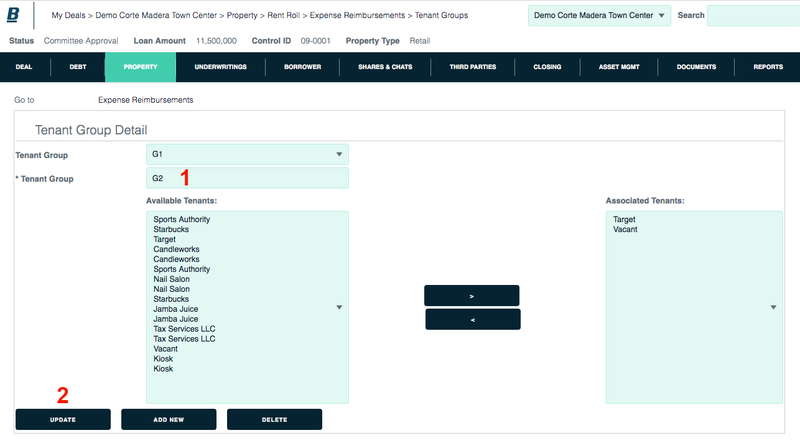 For commercial rent rolls, Backshop gives you a powerful interface to set up expense reimbursements. 1. Click the Property tab and Rent Roll sublink. 2. Click the Expense Reimbursements link in the Go to row. This takes you to the expense reimbursement detail page. If you don’t want to work with expense or tenant groups, skip ahead to Set up reimbursements, below. 1. Enter/check the required fields. Saving the expense group enables the expense picker. 1. Select available expenses on the left. Click the right arrow to associate them with this expense group. 2. Click Update to save changes. To add another expense group, click the Add New button. 3. When you are finished creating expense groups, click the Expense Reimbursements link. This takes you back to the expense reimbursements page. 1. 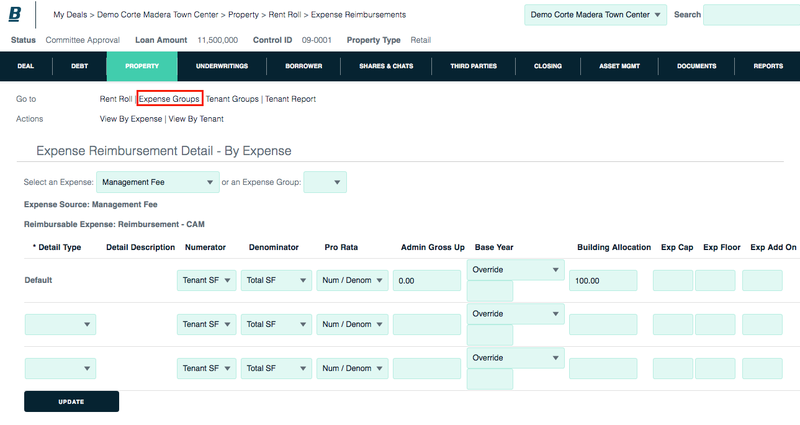 From within the expense reimbursements area, click the Tenant Groups link. 1. Enter the group name (required). Saving the tenant group enables the tenant picker. 1. Select available tenants on the left. Click the right arrow to associate them with this tenant group. 2. Click Update to save changes. To add another tenant group, click the Add New button. 3. 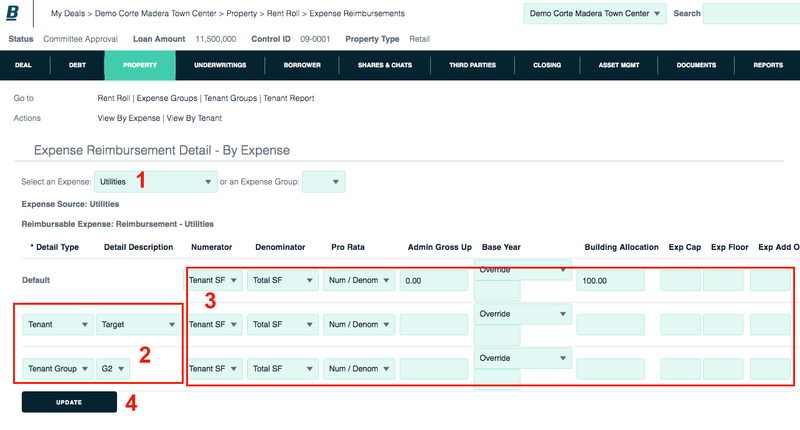 When you are finished creating tenant groups, click the Expense Reimbursements link. This takes you back to the expense reimbursements page. 1. Select an expense or an expense group. 2. Select one or more detail types. 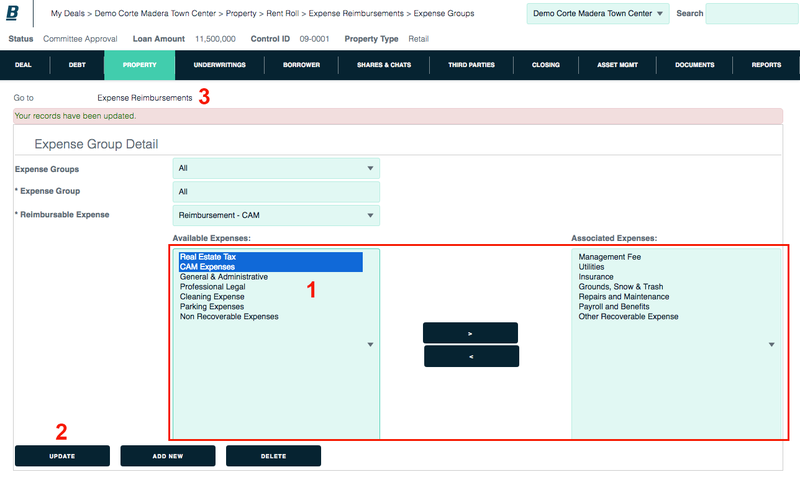 Choose from default, unit type, tenant group or specific tenant. 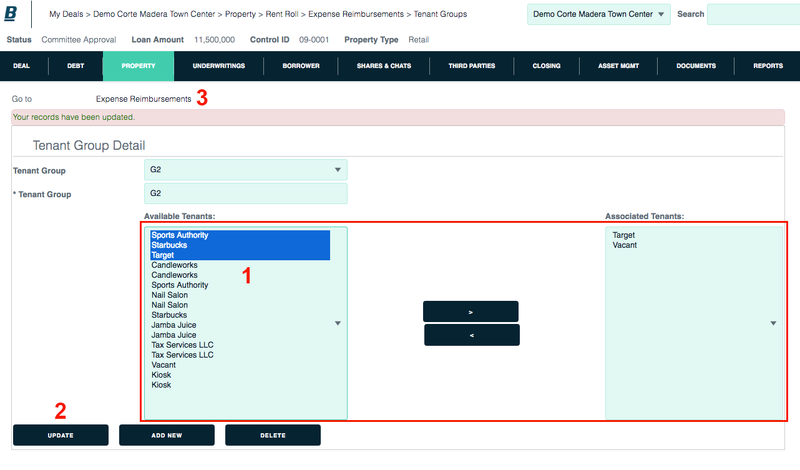 If needed, specify the unit type, tenant group or specific tenant. 3. Set the Numerator and Denominator to determine the Pro Rata percent. Input Admin Gross Up as a percent (115 equals an admin gross up multiplier of 1.15 or 15%). Set the Base Year, Building Allocation and expense cap/floor/add on.